VILLAS AND APARTMENTS TO RENT IN MARBELLA, SPAIN. 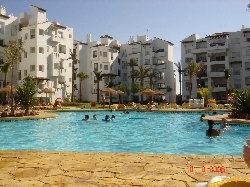 Welcome to our selection of holiday homes to rent in Marbella, Spain. Marbella and Puerto Banus may have a reputation as exclusive and expensive resorts, where the rich and famous come to spend their holidays, but there is plenty on offer for those on a budget and those looking for a family-friendly trip. Antonio Banderas, Joan Collins and Sean Connery may all have had holiday homes here in the past, but these days Marbella and Puerto Banus are making more of an effort to attract ordinary tourists, by developing family attractions such as water parks and beach facilities. The coastline of the Costa del Sol around Marbella and its neighbour Puerto Banus has a huge selection of beaches; everything from quiet and secluded coves to long stretches of sand complete with hotels, restaurant and bars. The main beach in Marbella itself is La Fontanilla, 800 metres long and found near the port area. This black sand beach has all the amenities you would expect for a busy resort, such as toilets and showers, water sports and life guards on duty during the summer season. Smaller beaches within Marbella include El Faro on the other side of the port from La Fontanilla, closer to the lighthouse and La Venus beach, with its more exclusive beach bars and sunbeds. You don't have to travel far outside the centre of Marbella to find a quieter and less developed area of beach; the long stretch known as El Cable is backed by sand dunes rather than buildings, but still has showers, toilets and life guards while the Rio Verde beach, next to the river of the same name, is close to some local Roman ruins, which could provide an interesting break from the sun if the temperatures get too high. The glamorous resort of Puerto Banus is a common and popular day trip for visitors all along the Costa del Sol, and is only a few minutes away from Marbella. Despite development in the area only starting in the 1970s, the area is now famous for its large marina which is worth walking round, if only to admire how the other half live. The town is not just known for its large yachts and sailing clubs, but also for its designer shops and style bars. It's a great place to splash out on a �haute cuisine� meal and drinks, get dressed up for the night and party with the rich and famous! Looking for self catering holiday accommodation in Marbella? Then below is a selection of holiday villas in Marbella and holiday apartments in Marbella that can be rented direct from their owners. You can either click on each listing for further details or you can use our search engine on the left if you are looking for something in particular. Old town and orange square - The Old town and orange square are surrounded by the old ruins of an old Arab wall, which had white washed streets, contained old churches and squares, and had lots of different fascinating shops and boutiques. The Orange Square is located in the centre of the old town, which goes back at early as 1485. It is surrounded by three landmarks, which are the town hall, the old governor's house and the Chapel (Hermitage) of Santiago. Bonsai Museum - The bonsai museum has a wide variety of bonsai trees to view. With a collection of over 300 trees to view from over 40 different species, this is a place for the whole family to enjoy. Funny Beach - If you�re an adrenaline junkie and love having a good time, then funny beach is the place for you. With a wide range of activities which include karting, mtor bikes, cars and boats, trampolines and even an ejection seat slingshot. From the beach you can participate in a range of watersports by hiring either jetskis, motorboats, sail boats and even pedalos. What used to be an small white fishing village, now has become one of the most cosmopolitan places of the Costa del Sol. Home of the most famous marina of the Mediterranean, Puerto Banus, which hosts the yachts of the social elite. Marbella may be a place the rich and famous like to visit, but there is plenty on offer for anyone. Marbella is making more of an effort in attracting other tourists and families by developing and improving the family attractions on offer such as the beach facilities and water parks to make the experience here a better one.